Celebrate the 40th anniversary of the Rainbow Pride Flag with the very first picture book to tell its remarkable and inspiring history! 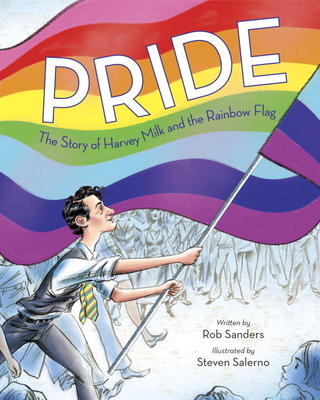 In this deeply moving and empowering true story, young readers will trace the life of the Gay Pride Flag, from its beginnings in 1978 with social activist Harvey Milk and designer Gilbert Baker to its spanning of the globe and its role in today's world. Award-winning author Rob Sanders's stirring text, and acclaimed illustrator Steven Salerno's evocative images, combine to tell this remarkable - and undertold - story. A story of love, hope, equality, and pride. "Pride is a beacon of (technicolor) light." "An essential LGBTQ children's book"
"This children’s book about gay Pride should be in every school." "The picture book about Harvey Milk and the Rainbow Flag is everything you needed as a kid." "I couldn’t be more thrilled the world now has this book." "This inspiring, positive story is a great introduction to two LGBTQ heroes and to the spirit of the LGBTQ community." "A welcome social history . . . Mission accomplished." "A children’s book that will properly express the struggle and joys that the LGBTQ rights movement went through." ★ "Offers little ones an age-appropriate introduction . . . Ebullient . . ."
"An uplifting introduction to the symbol of the Rainbow Flag . . . Vibrant and lively . . . Recommended for all collections." "A biography LGBTQ rights activists and allies can proudly share with children . . . A hope-filled ode to the rainbow flag." "A poignant and uplifting biography." "A tribute to a leader undertreated in young people’s literature." "Salerno’s strong art has a colorful seventies vibe . . . There is value here." "Pride: The Story of Harvey Milk and The Rainbow Flag beautifully tells the history of both Uncle Harvey's dream and his collaboration with Gilbert Baker to create a global symbol of equality and inclusion. This book tells a history that all children will cherish, and will inspire the next generation of hope givers, our world's youth"